If you currently trade stock and options you’ve probably pondered the idea of futures trading. I’ve outlined the basics in my post How Futures Work over at EminiMind. One advantage to trading futures over stock and options is the ease of entry and exit. The futures markets are extremely liquid meaning there are a lot of buyers and sellers at all times making producing tight spreads, quality fills, and less slippage. 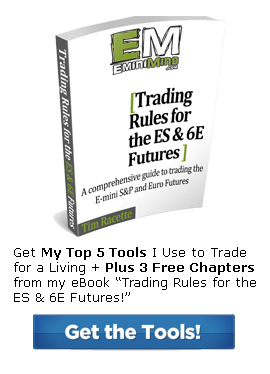 If you’re considering trading futures, you may be interested in my guide: Trading Rules for the ES & 6E Futures. This comprehensive guide outlines the specific rules and setups used to trade these markets. Robert Green from Green Trader Tax talks about what you need to know to setup your own Trading Entity and important information regarding taxes. Click here to view the video presentation after registering for free at moneyshow.com.